Last December, Dr. Abba Zubair from the Mayo Clinic received a grant to grow stem cells aboard the International Space Station. Dr. Zubair currently grows stem cells that have the potential to treat hemorrhagic stroke by regenerating neurons and blood vessels. The problem is that they grow super slowly, which would be a huge limit to the delivery of these cells to potential patients. (From Science Daily). 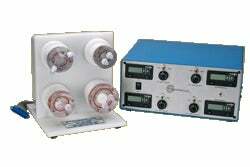 Previous labs have used Rotary Cell Culture Systems (pictured) to simulate microgravity while culturing cells. They found that in these conditions, stem cells can grow faster, and also supports their development into specialized cell types. Therefore, Dr. Zubair believes that stem cells grown in space will thrive, allowing for large numbers to be grown for treatment. He goes on to speculate that one day we'll have stem cell labs in space able to quickly provide folk on Earth with organs. Similar to the plant story, I have some huuuuuge worries about the effect of radiation on stem cells. Rapidly dividing cells that are acquiring a lot of mutations? Hello, potential for cancer! 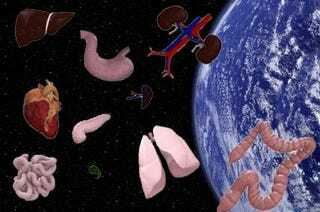 Even without that worry, I would imagine that some organs would need to develop in Earth-like gravity. Still, it'll be very cool to see how those cells grow in space. Even if it doesn't turn into a way to mass produce stem cells, I bet they'll learn a ton.